Theo Colborn, one of the people I’ve been working for for the past few years, has passed away. It breaks my heart, but I can’t be sad, because every time I think about her, I smile. She lived a good life and a righteous life for a very long time. She lived in a beautiful part of the world – Colorado. And she had a son she could be proud of – who flies the night helicopter for the Dallas Police. When Theo came to town, she’d go up joy riding, chasing bad guys with the searchlight, long into the night. RIP, my hero, The one and only Theo. If you ever have any doubt about what to do – do what Theo would do. And when the going gets tough – for god’s sake win one for The Theo. Rhymes with “hero.” Means god in greek. She meant a lot to everyone. If you ever had the chance to meet her, even once, you knew Theo Colborn. She didn’t have a single hidden agenda. Her commitment to uncovering the truth was out there for the world to see. For nearly 30 years she dedicated herself to revealing the dangers of endocrine disrupting chemicals to wildlife and humans. More recently she alerted us all to the threats posed by chemicals associated with oil and gas development. She wove the two together beautifully in her statement The Fossil Fuel Connection, which she worked on until the day she died. Theo’s visionary leadership and passion shone most brilliantly when she made direct connections between new ideas, scientists whose work confirmed them, impacted individuals, and people in positions to change what needed changing. She will be remembered for many generations to come, generations that she worked tirelessly to protect. Theo often feared that we had already passed the tipping point — that our intelligence and compassion had been so compromised by endocrine disruptors that we could no longer think our way out of the crises we had created. 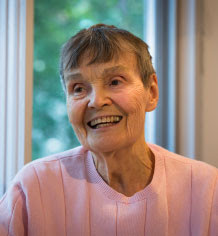 By the time Colborn died on Sunday, at the age of 87, she had immersed herself in decades of research — and inspired even more research — that sought to do just that. The many, many proposed BPA bans? Go back to the very beginning, and you’ll find Colborn. The concern over dwindling sperm counts? Same thing. I was working on a book on the state of the environment of the Great Lakes. And I pulled all this literature together, lots of papers, you know: fellows working in Canada, people working in the United States, one out on Lake Superior, others over, way over on Lake Ontario had done some work, written their papers, had them published in a number of different journals. None of them knew what the other was doing. And basically, I sat in a wonderful position where I pulled all this information together. And looking at it I said, “There is something wrong here.” And the easiest thing for me to do is to use — thank goodness for computers — use a spreadsheet at a computer and start producing these spreadsheets. And as I plotted those names of the animals in the column on the left-hand side, this is called the “Y” column, and then on the “X” column I plotted the effects that were seen in the animals, it began to fall out that there were serious problems and actually population declines, population crashes, actually extirpation of some populations. They disappeared in some places. What Colborn was seeing was the result of a wide variety of synthetic chemicals that had come into being in the 1950s and ’60s. Even though they were present in the water at very low concentrations, they were subtly changing how the animals in that system developed — how their genes were programmed, how their cells differentiated and spread out through their bodies, and, ultimately, how they were able to survive and reproduce into the next generation. The healthy wildlife around the Great Lakes, often, were those animals that had grown up elsewhere and migrated as adults. When their offspring failed to reach adulthood, or couldn’t reproduce, they were replaced by a fresh fleet of new arrivals. The lakes looked healthy, in other words, but they were a death trap. Colborn credited this breakthrough, in part, to her unconventional scientific background. I looked at it from an entirely different perspective. I looked at endocrinology differently. I began to look at toxicology. I was not trained in toxicology. I was trained in pharmacology until I went back to college to get my Ph.D. in my old age. Only then did I begin to sit in on toxicology courses. There is a reductionism in scientists, in the scientific community. I have never been a reductionist. I am always thinking about the big picture. My thesis committee for my Ph.D. will tell you that. They had trouble with me. At the time, Colborn said, scientists working on environmental issues had primarily been looking for cancer, which she described as “the big bugaboo.” Cancer was a rare event: In order to emerge, it had to circumvent the body’s defenses, and in a polluted community, not everyone would come down with it. What Colborn found was different: To a developing organism, even an infinitesimally small exposure could alter fetal development and the possible effects — lower IQ, organ damage, trouble reproducing — could be spread out across a community like jam on toast. The concept was so new there wasn’t even a term for it. In 1991, Colborn and a team of 21 international scientists working on the issue came up with one: endocrine disruption. Unlike a lot of scientists, Colborn was not shy about becoming a public figure. She co-authored a popular science book with the dramatic title of Our Stolen Future. She founded a nonprofit called the Endocrine Disruption Exchange, which, among other things, helped fund and cheerlead more research into endocrine disruption and its causes. Still, her big message was incontestable — that over 60 years ago, we began to introduce all of these chemicals into the environment, and we still have no idea what most of them do to us. In raising these questions, Colburn got us closer to looking for answers. Theo’s family has requested that in lieu of flowers, donations be sent to TEDX.